W2-0025: Tepantitla Mural 3 – Mountain of Abundance The compound of Tepantitla is decorated with a number of murals that provide a fascinating insight into how the Teotihuacano believed the world worked and how it had to be maintained. 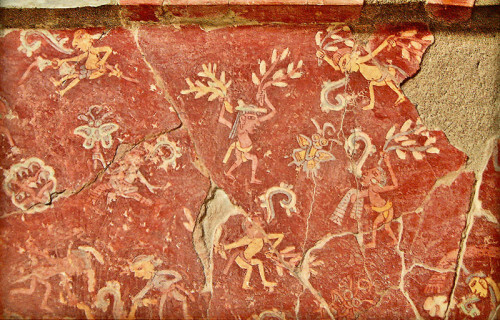 Perhaps the most fascinating scene is within Mural 3 (fig. 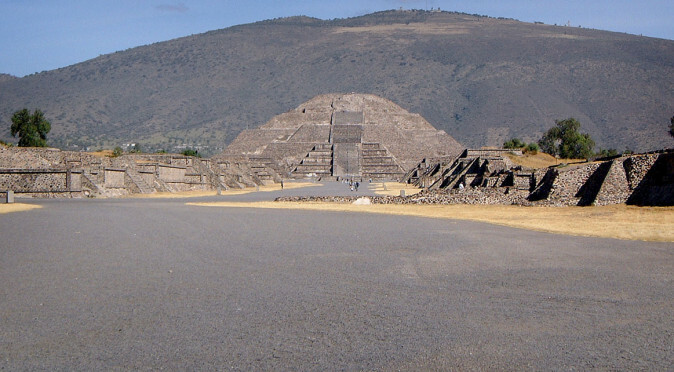 W2-0025), typically known as the “Paradise of Tlaloc”, where normal people in everyday clothes are going about their daily lives, playing games and picking flowers. Central to the scene is a mountain that pours with water filled with fish and vitality, which flows into the rivers and canals and irrigates the crops that are being sowed and reaped. But far from being a portrayal of paradise, the scene actually depicts the mountain being fed with humans. From the top of the mountain you can see a train of people falling inside, with their blood flowing down and transforming into the life giving waters. The scene includes people of three different colours: red, yellow and blue. These different colours presumably represent different classes or castes, but together they are all being churned into water regardless of their creed – although the red people appear to be faring worse, as two of them float upside down and headless within the bloody cascade. Around the mountain it is possible to identify some of the activities taking place. 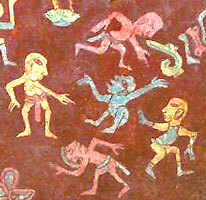 In one section a group of “Ball-Players” are playing the ritual game using a blue man as a ball, which they hit using their hips (fig. 2-0025P). Another scene also features a pair of people playing a game with a small blue ball, which looks like a complicated game of catch (fig. 2-0025G). 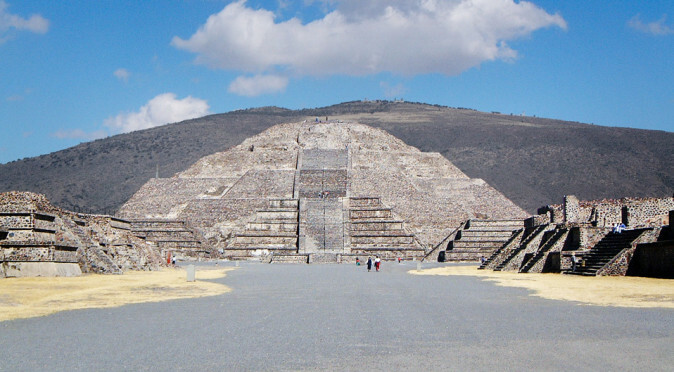 Elsewhere, a line of people appear bound together and are being led to the mountain to be sacrificed (fig. 2-0025S). There are also a number of people hunting butterflies with branches and nets (in fig. W2-0026 you can see a net draped over the arm of the man furthest to the right). Curiously, the butterfly in some scenes (fig. W2-0026) wears the goggles that are associated with Tlaloc, the God of Rain, though more recent research suggests the goggles may relate to war. Elsewhere in the room, there are scenes with priests or warriors who wear ritual attire and are either sowing seeds or giving offerings to the earth. 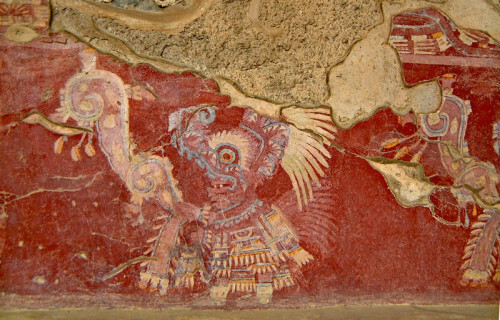 Some of the priests/warriors wear a very distinctive headdress that combines the eye of an owl/hawk (as seen in Tetitla) with the snout of a crocodile. 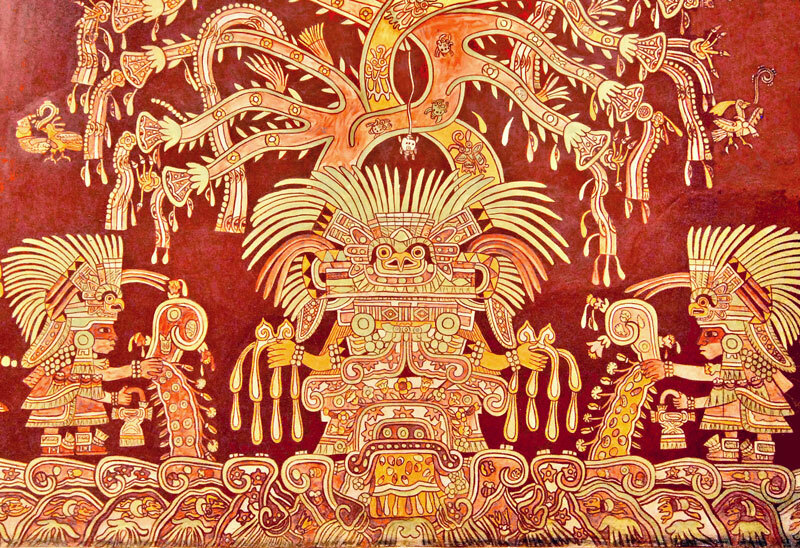 On the front of the tunic is a motif that looks like a temple with a crescent upturned on top, which is most likely the emblem glyph for the district, town, city or state that he represents. 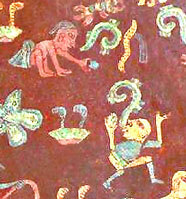 The billowing spirals are normally associated with speech-bubbles, but here they emanate from his hands and are probably describing something about the seeds or offerings that he throws – there are small pictures within the speech-bubble, but it is impossible to tell what they represent, however around the outside of the bubble it is possible to identify flowers and maize (the maize is clearly visible on the right hand speech-bubble in fig. W2-0024, which belongs to the preist who is just out of shot). W2-0027: The Great Goddess – Reconstructed Mural located in the MuseumAbove the mountain is another scene where similarly dressed priests or warriors carry out the same action of sowing seeds or giving offerings, only this time they are giving them to a central tree deity, known as the Great Goddess. 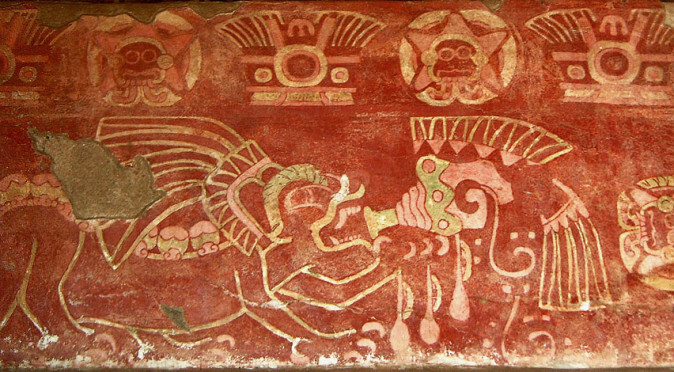 These priests wear hawk headdresses, carry tribute bags and wear slippers with pompoms on them (this unusual footwear is also found on the stelae at Quirigua and on the reliefs of the Pyramid of the Plumed Serpents at Xochicalco – both of which relate to the Maya). The Great Goddess also wears the hawk headdress, underneath which you can see her masked eyes, round ear-flares, and a nose-bar that has pendants dangling from it, which are thought to resemble spider-fangs – hence she has been dubbed the Spider-Woman. Blood or water drips from her hands and a flowering tree rises from her head. This scene almost certainly describes how the priests fed the Great Goddess and how she gave the people great abundance in return. 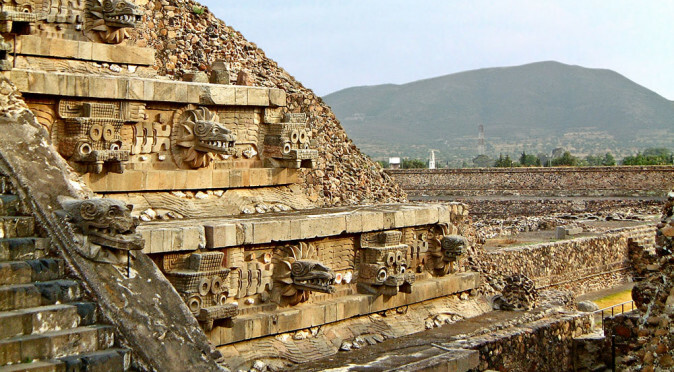 The notion of feeding the gods was commonplace in Mesoamerica, but what makes the scenes of Tepantitla unusual is that they portray everyday people, warriors and priests making the offerings. 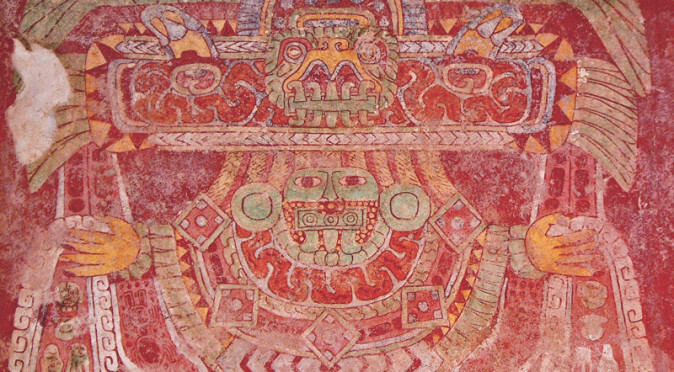 Typically, elsewhere in Mesoamerica, it would be a Divine Ruler who would be pictured presenting sacrifices and communicating with the Gods. Archaeologists have yet to discover any references to any single ruler at Teotihuacan and haven’t yet uncovered any elite burials, which raises the possibility that life at Teotihuacan was more community based, with common people and localised priests or warrior-lords being responsible for keeping the gods fed and happy. 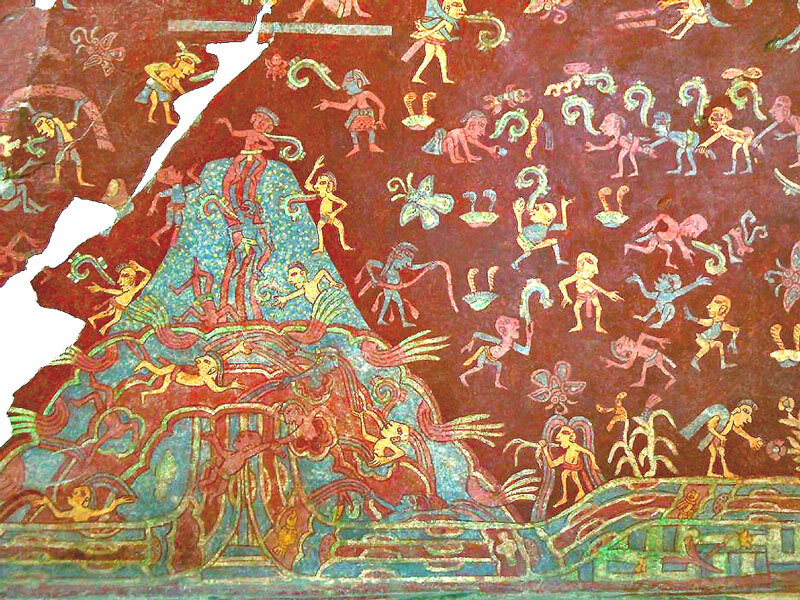 Pyramid of the MoonClearly the murals of Tepantitla are a vision of the Teotihuacano world-order, but they are obviously unlikely to be a literal account of actual events. 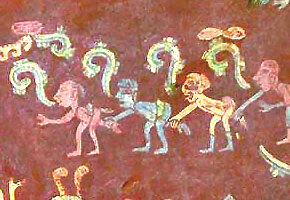 Rather, they depict the rituals and festivities that took place which symbolised this process. 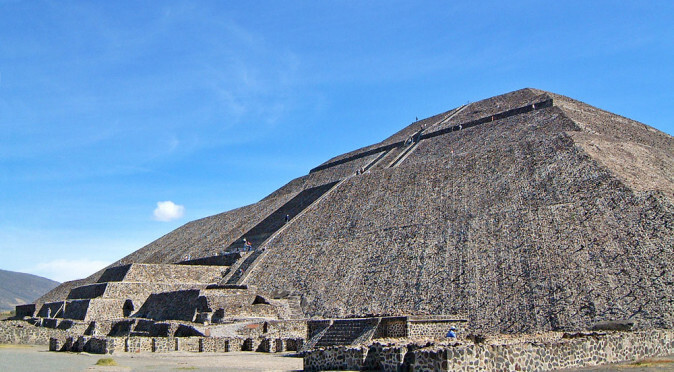 For example, if we replace the mountain with Teotihuacan’s man-made mountains, then we can see the mural is teaching us that humans need to be sacrificed on the Pyramid of the Sun, the Pyramid of the Moon and the Pyramid of Quetzalcoatl to keep the waters of vitality flowing and keep the Teotihuacano world-order working. 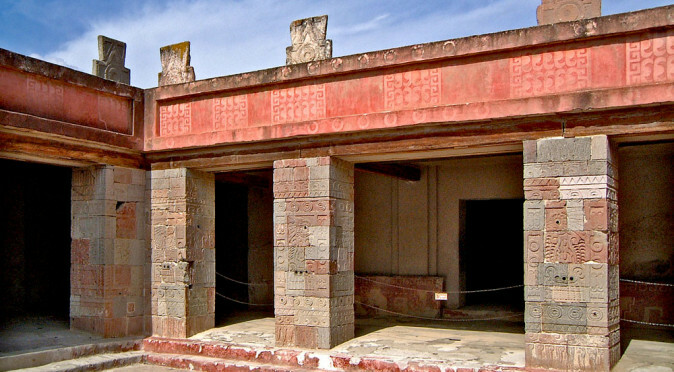 As such, it seems fairly certain that the compound of Tepantitla was either part of a schooling system, a municipal council building, or an assembly hall where the leaders of Teotihuacan would convene, and that the murals were designed to recount the covenant between the city and its deities.